Visual information is of the utmost importance to road users. In darkness, both public lighting and vehicle lighting help road users take stock of the traffic situation and help them to be seen by others. Installing public lighting leads to a 50% reduction in the number of nighttime injury crashes. Disavantages of public lighting are, among other things, the risk of collisons with lamp posts, light pollution and the costs of material, maintenance and energy consumption. The road safety effects of a reduction in illuminance level on motorways vary according to the traffic situation. Cycling in darkness is safer with bicycle lights than without. Daytime running lights (DRLs) result in fewer daytime accidents. They do not reduce the visibility of cyclists and pedestrians. Why is (adequate) lighting important for road safety? Visual information is of the utmost importance to road users. In darkness, this information is harder to obtain than in daylight, since human eyes are then less able to discern objects, colours and movement  . To support human eyes at times and places when and where natural light sources are not adequate, public lighting may be installed. In the dark, public lighting enables people to discern the road, other road users and the environment to a sufficient degree. The higher the level of illuminance, the sooner an object is discerned. Moreover, public lighting reduces glare caused by the significant contrast between the headlights of other cars and the dark environment, which is also called headlight glare . Such glare increases the accident risk, in particular for older road users (see the archived SWOV factsheet Visual impairments and their influence on road safety). Some studies say that public lighting has a positive impact on behaviour. The better the quality of the lighting, the sooner drivers discern intersections and adjust their speed (Rockwell, 1969, as described in Beyer & Ker ). Other studies, however, have not proved a difference in speed on account of public lighting   and less safe behaviour has also been proved . Activating one’s vehicle lights is important to discern the course of the road and to see and be seen by other road users. Therefore, all vehicle lights should function well and be correctly tuned. Incorrectly tuned lights or the wrong kinds of lights or luminaires could result in glare to oncoming vehicles. Glare arises when the human eye used to a low level of luminance (when it is dark) is suddenly subjected to such a bright light that the eye cannot sufficiently adjust. The primary function of bicycle lights is to be seen by others. On account of the limited luminous intensity, it is probable that bicycle lights will hardly help cyclists determine the course of the road. How important is (adequate) lighting for road safety? Meta-analysis on the basis of studies from different countries has shown that the number of accidents in darkness substantially decreases after installing public lighting  . On Dutch roads, the installation of public lighting leads to a 50% reduction in the number of nighttime injury crashes . The positive effects of lighting are usually abated by the human tendency to behave less safely once the environment appears to be safer. This is called ‘behavioural adaptation’ .Yet, the net effect is (very) positive. Table 1. Effect of public lighting on nighttime accidents on previously unlit roads[i] . Table 1 shows that the installation of public lighting along roads affects the number of fatal crashes more than the number of injury crashes or crashes resulting in material damage only. Moreover, in rural areas the effect of lighting is stronger than in urban areas, especially where fatal crashes are concerned. The installation of public lighting also affects the pedestrian accident risk more than the motorists’ risk.  . Research in the Netherlands shows that public lighting affects the safety of vulnerable road users (pedestrians, cyclists, moped riders) more than the safety of motorists. Research into increasing the existing level of illuminance shows that the effect depends on the extent of the increase and the level of illuminance before the increase  . See Table 2. This does not mean that switching off the lighting or lowering the illuminance level always has a negative effect on road safety. The effect appears to depend on the extent of the reduction in the illuminance level and the circumstances on the road, such as traffic flow and the complexity of the road design (also see the question What is the road safety effect of (partially) switching off public lighting on motorways?). We are not aware of any research into the road safety effect of motor vehicle lighting in darkness. Considering the function of vehicle lighting, a positive effect seems likely (also see the question Why is (adequate) lighting important for road safety?). That the use of vehicle lights is not under discussion, could explain the non-existence of research into the effect. We do know, however, that motor vehicle lighting has a positive effect on road safety (also see the question What is the road safety effect of daytime running lights?). Cycling in the dark is safer when using adequate bicycle lights. Reliable figures about the extent of the road safety effect of adequate bicycle lights are missing however (also see the question How dangerous is cycling in the dark without adequate bicycle lights?). [i] For a number of categories (injury crashes on all roads and on roads in rural areas) the meta-analysis by Elvik et al. contained sufficient results to correct them for publication bias. Publication bias refers to the bias that arises when especially those research results are published that are significant or positive, which means that negative or unclear results are underreported. Since not all categories have been corrected for this bias, only the uncorrected results are presented in this factsheet, so that the results may be compared. What are possible disadvantages attached to public lighting? Apart from the numerous advantages of public lighting, there are also a few disadvantages. Public lighting may have a negative effect on road safety since lighting colums could be collision objects. Annually, Dutch police register 16 fatal accidents on account of a collision with a lamp post. In 71% of these accidents, a car collides with the lamp post. 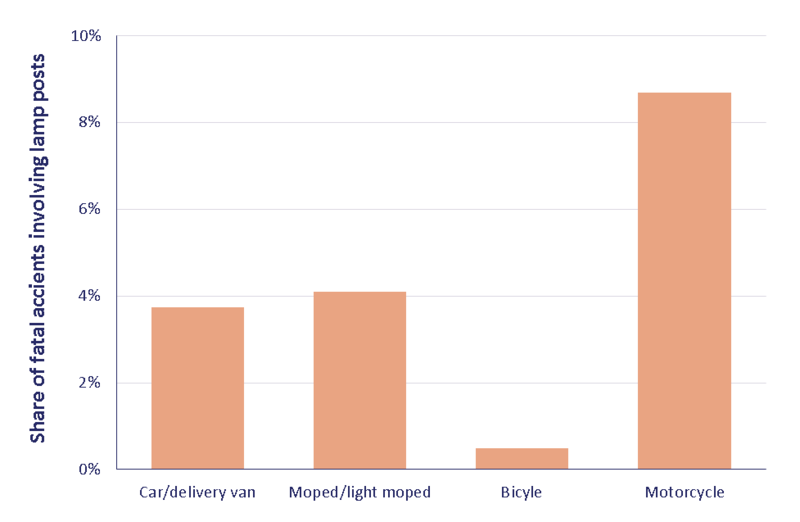 The share of fatal accidents involving lamp posts in the total number of fatal accidents is largest for motor cycles, see Figure 1. With this in mind, it is advisable to position the lighting colums as far away from the carriageway as possible; from a lighting-technical point of view, however, the light source should not be positioned too far away from the carriageway. Figure 1. The share of registered fatal accidents involving lamp posts in the total number of registered fatal accidents per transport mode in 2007-2016, per transport mode (Source: IenW). Crash-friendly lighting colums may reduce the severity of collisions with lighting colums  . A crash-friendly lamp post is constructed in such a way that it offers little resistance and breaks away when a vehicle crashes into it. On motorways, crash-friendly lighting colums reduce the risk of personal injury crashes by 50% . A crash-friendly lamp post can therefore be positioned without safety barriers within an obstacle-free zone  . A crash-friendly lamp post does need to be positioned in such a way as to cause no further damage after a collapse . A crash-friendly lamp post has, however, been designed for cars and will therefore have little effect on the number of motorcyclists that die after a crash involving a lamp post. According to the Government Energy Platform (an independent library portal about governmental energy policies), public lighting in the Netherlands amounted to approximately 1.5% of all electric lighting produced in 2014 . The 2013 Dutch Energy Agreement states that, in comparison to 2013, the Netherlands aim to have saved 20% in energy needed for public lighting by 2020, and 50% by 2030. This may be achieved by replacing at least 40% of present lighting by LED lighting. Plant growth may be disrupted by lighting. The germination, pollination and bloom of certain plants (e.g. hops) may be disturbed by artificial light at night. Public lighting may disturb the biorhythm of animals (day and night or annual rhythm), may attract animals to places where they may be overrun or may scare away animals from potential breeding grounds or nesting places . Human day and night rhythm may also be disturbed by public lighting. Of course, public lighting involves costs. Think of material, maintenance and energy costs. A measure is cost effective when the benefits (road safety benefits) outweigh these costs. Dutch research proves that, on most Dutch roads, public lighting is cost effective as far as lower illuminance levels and cheaper installations are concerned . Moreover, it appears that an increase of illuminance levels is effective within urban areas, whereas it is not in rural areas. Norwegian data show that illuminating roads that were previously unlit is cost effective on most roads (with the exception of motorways) with a minimum traffic volume of 15.000 vehicles a day . What are the guidelines for public lighting? Several guidelines are relevant to the installation and use of public lighting. The Dutch quality criteria for public lighting are based on European standards dating from 2015. They have been laid down by the NEN (Dutch Standards Institute) and the NSVV (Dutch Illumination Foundation) in the NPR (Dutch Code of Practice) 13201. NPR 31201 describes, among other things, what the illuminance levels should be, depending for example on the road surface luminance[i] and the constancy of illuminance . Important in this respect is the position and height of lamp posts. Road surface reflection should also be taken into account: when the road surface reflects more light, the lighting can be less bright. When tuning the illuminance levels, a sound balance between safety and the negative aspects of illuminance (e.g. light pollution) should be aspired to. Luminaires and lighting systems should comply with the relevant standards, such as the Low Voltage Standard and the NEN-EN 40 for lamp posts. Apart from this, public lighting should also comply with the general standards for electric installations, such as NEN 1010, NEN-EN-50110 and NEN 3140. Finally, the NSVV has published a ‘General guideline concerning light pollution’ (‘Algemene richtlijn betreffende lichthinder’) of which part V concerns public lighting. These guidelines are applicable to roads in urban and rural areas and apply to all road authorities. The technical guidelines for motorways in the Netherlands are described in ROA Illumination  and ROA Crash Barriers ; these quidelines are presented in more detail in the Illumination Implementation Framework. ROA Illumination indicates, among other things, at which types of road sections and intersections illumination is necessary and which mimimum quality criteria motorway illumination should comply with. ROA Crash Barriers presents quidelines for positioning lamp posts on road shoulders. The Illumination Implementation Framework states, among other things, that the lighting on national roads must be switched on six minutes after sunset, and must be switched off twelve minutes before sunrise. The positioning of lamp posts along rural roads is described in the Road Design Manual  . The guidelines for illumination of urban roads are included in the Recommendations for Urban Traffic Facilities (ASVV) . The guidelines for the choice of lamp post types are to be found in the Lamp post Manual . These guidelines apply to all Dutch roads. [i]. Road surface luminance is the intensity of the light reflected by the road surface. What is the road safety effect of (partially) switching off public lighting on motorways? In general, a reduction of the illuminance level on motorways results in a decrease in road safety. The effect on road safety does, however, depend on the degree of the reduction of the illuminance level and the road circumstances, such as traffic flow and the complexity of the road design. Therefore, there is no consensus about the impact of (partially) switching off public lighting on motorways. For environmental reasons and in order to save energy costs, public lighting in the Netherlands is sometimes dimmed or switched off (see for example    ). Thus, lighting on urban ringroads, motorways with high traffic flow, or roads that were sub-optimally designed is dimmed from 11 pm to 5 am, whereas it is completely switched off on other motorways. An international meta-analysis of accidents in different illuminance conditions, shows that a 50% reduction of the illuminance level, by switching off every other lamp post along (mostly) motorways, involves a 17% increase of the injury crashes and a 27% increase in the number of crashes resulting in material damage only . However, a study by Rijkswaterstaat (Directorate for Public Works and Water Management) shows that completely switching off public lighting on Dutch motorways with a low traffic flow and a safe road design hardly affects road safety  . This research result is remarkable in the light of the international meta-analysis: according to the researchers, the negative consequences of switching off public lighting depend on the traffic flow along the road section. If the traffic flow is very low, switching off public lighting does not have any negative consequences for road safety. Martens  reports that switching off every other lamp post on provincial roads (with the exception of intersections and roundabouts) does not have any negative consequences for driving behaviour, perceived safety and subjective workload. In this study, the effect of switching off every other lamp post on the accident risk is not discussed. Why is tunnel lighting important? The transition from open roads to tunnels causes a transition in illuminance circumstances, in particular in the daytime. It is important to realize a gradual transition at the entrance and exit of a tunnel; the human eye needs several seconds to adjust to the change of situation. If the illuminance transition is too abrupt, road users are unable to discern details for a few seconds and that may be enough to distract them (see the archived factsheet The road safety of motorway tunnels). What are the Dutch regulations for using vehicle lighting? In Table 3, the regulations for the use of different lighting for cars and delivery vans are presented . Front dipped headlights are obligatory in the dark. During poor visibility front headlights may also be dipped in the daytime. Main lights may only be used in the absence of other traffic nearby. Fog lights may only be used when fog, snowfall or rain seriously reduces visibility. Rear fog lights may only be used when visibility is less than 50 m.
Daytime running lights are lights that may be used in the daytime. Since 2011, all new car types to be marketed must have daytime running lights. Rear lights must always be used in combination with dipped headlights, main lights, parking lights or fog lights. In the case of a stop in rural areas in parking or emergency lanes, or in lay-bies, both parking lights and rear lights must be used in the dark or when visibility is poor. Table 3: Regulations concerning vehicle lighting of cars and vans. In 2008, the European Commission issued ‘directive 2008/89/EG’ which made daytime running light (DRLs) compulsory for new cars, from 2011 onwards. This implies that when starting a car, the daytime lights are automatically switched on. In a number of countries, using daytime lighting is compulsory. In the Netherlands, using daytime lights is not compulsory, but does result in fewer daytime accidents (also see the questions What is the road safety effect of using vehicle lighting in the daytime? en What are the possible disadvantages of vehicle lighting in the daytime?). Requirements for motorcycles are the same as for cars. In addition, motorcycles must have a red rear reflector . In darkness and poor visibility, mopeds, light mopeds, electric scooters, motorized bicycles or speed pedelecs need to use yellow or white front lights (dipped lights) and red rear lights . In addition, these vehicles need to be equipped with a number of reflectors: red rear reflectors, amber pedal reflectors and amber side reflectors. From 1 January 2016, all newly registered L-category vehicles (two- and three-wheel motor vehicles) need to be fitted with Automatic Headlights On (AHO, see index of road safety measures SWOV). This implies that, for all motor cycles, speed pedelecs, mopeds and light mopeds, the headlights automatically switch on when starting the motor. In darkness or poor visibility, cyclists need to use white or yellow headlights and red rear lights. These lights must shine straight ahead or backwards respectively and must not flash. They can be detachable lamps that are attached to the bicycle or the cyclist, provided they are clearly visible. In addition, bicycles need to be fitted with reflectors: a red rear reflector, yellow pedal reflectors and white or yellow rim or tyre reflectors . There are no requirement for the quality of bicycle lights. Education campaigns about bicycle lights are particularly focused on using lights rather than using adequate lights, in spite of the often poor quality of biclycle lights . 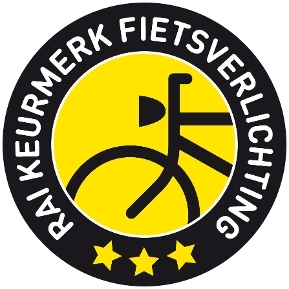 Therefore, In 2017, RAI (Bicycle and Car Industry Association) introduced a bicycle lighting hallmark to familiarize cyclists with the best options when buying bicycle lights (see www.keurmerkfietsverlichting.nl). This hallmark is familiar to most bicycle shop employees, but is hardly ever inquired after by their customers . There is no information about how many different bicycle lights have earned the hallmark. [i] These requirements are dependent on the width and length of the vehicle. More information is to be found on the RDW website). What is the road safety effect of using vehicle lighting in the daytime? Daytime running lights (DLRs) reduce the number of daytime accidents. Daytime vehicle lighting ensures a greater contrast between vehicle and environment, which makes approaching vehicles more conspicuous. In-depth studies of accidents show that in 50% of the daytime accidents, the other road user was not discerned or discerned too late; at intersections, this is even the case in 80% of the accidents . On the basis of theoretical evidence and observational research, the beneficial effect of daytime running lights is, above all, explained by the greater contrast between a vehicle and its environment: this increases the conspicuousness of vehicles and makes them more easily identifiable (recognizable as an approaching motor vehicle). An additional effect is that vehicles with DRLs are estimated to be closer than they really are. This results in approaching traffic taking fewer risks during overtaking manoeuvres and during approaches at intersections . A worlwide meta-analysis of 41 studies into the effect for cars and 16 studies into the effect for motor cycles shows that DRLs reduce the number of daytime injury crashes by 3-12% . The effect on the number of fatal crashes can be estimated to be a little higher (-15%). DRLs on motor cycles lead to a 5-10% reduction in the number of injury crashes. What should be noted is that the results per study differ greatly . A more recent study showed that DRLs reduced the number of head-on crashes and side impact crashes by 12%; the number of accidents involving cars and pedestrians/cyclists even decreased by 20% (Hoye, 2014 mentioned in ). According to Koornstra et al. the effect appeared to be dependent on the degree of latitude of a country. Eriksson en Sandin  conclude that present research shows that DRLs have a positive effect on road safety, but there is no consensus about the extent of the effect. What are the possible disadvantages of vehicle lighting in the daytime? A possible disadvantage of the use of daytime running lights (DRLs) is an increase in fuel consumption. After all, switching on the lights results in a bigger load on the dynamo. Using conventional dipped headlights for DRL increases fuel consumption by 1-3%, dependent on the fuel consumption of the car. Using dedicated daytime running lights leads to a 50% reduction in fuel consumption by lighting; using LED lights results in a maximum reduction of 90% (see the archived SWOV factsheet Daytime Running Lights (DRLs). Moreover, a recurring supposition is that DRLs for cars reduce the visibility of other road users who do not make use of lights in the daytime, such as pedestrians and cyclists (masking effect). Research has shown, however, that this effect does not occur . Pedestrians and cyclists even seem to benefit from the DRLs used by the cars around them, since they are illuminated by the car lights. For motor cyclists, vehicle lighting in the daytime has been customary longer than for car drivers. Previously, the use of DRLs was unique to motor cyclists, which made them more conspicuous than other road users. Research has shown that particularly for great distances and on rural roads DRLs of motor cyclists have a positive effect on the visibility of motor cyclists to other road users . The effect of DRLs used by car drivers on the visibility of motor cyclists is not absolutely clear  . Cycling is the dark is safer when cyclists use adequate bicycle lights. At the moment, we do not have reliable figures about the extent of the road safety effect of adequate bicycle lights. Injury crashes registered for 2002-2010, indicate that bicycle lights do have an effect (see the SWOV factsheet Cyclists). A regression analysis shows that, for cyclists cycling in the dark, the risk to fall victim to an accident is reduced by 17% in the case of a working front and rear light . The authors note, however, that the uncertainty of the outcome is significant. Nor has the quality of the biclycle lights been taken into account (the results are related to bicycle lights that were customary in 2002-2010) . What is certain, however, is that the accident risk for cycling in the dark is higher than for cycling in the daytime  . After a correction for the distance travelled, the risk of serious crash injuries for cyclists is highest in the early morning dark (after midnight until morning twilight). Apart from poorer visibility, other factors, such as alcohol consumption, contribute to the higher risk of cycling in the dark . Dutch research has shown that 41% (in entertainment districts between 10 pm and 3 am) to 64% (between 5 pm and 9 pm, and between 6.30 am and 9 am) of cyclists cycling in the dark use bicycle lights  . See the SWOV factsheet Cyclists. Is there a safety difference between types of lamps? No research into the road safety effect of different types of lamps for public lighting and vehicle lighting has been found (see below). We do not expect a large effect as long as the lighting complies with the present guidelines and legislative framework. There are different types of lamps for public lighting: halogen sodium and metal halide lamps, such as SON-T and SOX-E; compact fluorescent lamps, such as TL-S and Luminlux; and LED lamps. The different types vary in efficiency, light colour, extent of light diffusion and dimmability, which means different lamps may be used for different roads. Due to environmental considerations, LED lighting is favoured more and more . As long as the lamps and luminaires comply with the guidelines for public lighting, no effects on road safey are to be expected. For vehicle lighting three types of lamps are used: halogen lamps, xenon lamps and LED lamps. These types differ in price, efficiency, lifespan, costs and luminous intensity. Traditional halogen lamps are more and more often replaced by xenon or LED lamps. These lamps have a higher efficiency and a higher luminous intensity. Correct mounting of these lamps in the correct luminaires is essential to prevent glare for or from oncoming traffic. Glare for or from oncoming traffic is a recurring complaint with regard to these new lamps. The colour of the light shining from LED lights (‘blue’ light) is often complained about as well. There is, however, no research that proves that xenon lamps or LED lamps negatively affect road safety. There is a large difference in quality of bicycle lights and of the luminous intensity of the lamps used. So far, no research has been done into the road safety effect of these different bicycle lamps. Below, you will find a list of references used in this factsheet. All sources are retrievable through our library portal. Further literature about this subject may also be found there.
. CROW (2002). Handboek wegontwerp wegen buiten de bebouwde kom: Basiscriteria. Publicatie No. 164a. CROW kenniscentrum voor verkeer, vervoer en infrastructuur, Ede.
. Boyce, P.R. (2009). Lighting for driving: Roads, verhicles, signs, and signals. CRC Press, Boca Raton, florida.
. Beyer, F.R. & Ker, K. (2009). Street lighting for preventing road traffic injuries. In: The Cochrane Database of Systematic Reviews, 2009, No. 1, Art. No. CD004728.
. Mäkelä, O. & Kärki, J.L. (2004). Tievalaistuksen vaikutus liikenneturvallisuuteen ja ajonopeuksiin [Impact of road lighting on road safety and driving speeds]. Finnish National Road Administration, Helsinki.
. Assum, T., Bjørnskau, T., Fosser, S. & Sagberg, F. (1999). Risk compensation—the case of road lighting. In: Accident Analysis & Prevention, vol. 31, nr. 5, p. 545-553.
. Wanvik, P.O. (2009). Effects of road lighting: An analysis based on Dutch accident statistics 1987-2006. In: Accident Analysis & Prevention, vol. 41, nr. 1, p. 123-128.
. Elvik, R. (1995). A meta-analysis of evaluations of public lighting as accident counter measure. In: Transportation Research Record, vol. 1485, p. 112-123.
. Bhagavathula, R., Gibbons, R.B. & Edwards, C.J. (2015). Relationship between roadway illumination level and nighttime rural intersection safety. In: Transportation Record: Journal of the Transportation Research Board, vol. 2485, p. 8-15.
. CROW (2002). Handboek wegontwerp wegen buiten de bebouwde kom: Stroomwegen. CROW kenniscentrum voor verkeer, vervoer en infrastructuur, Ede.
. CROW (1999). Veilige inrichting van bermen. Richtlijnen voor het ontwerpen van Autosnelwegen (ROA). CROW kenniscentrum voor verkeer, vervoer en infrastructuur, Ede.
. AVV (2006). Botsveilige lichtmast biedt veel voordelen. In: Bermwijzer – nieuwsbrief Steunpunt Veilige Inrichting van Bermen, juni 2006. Directoraat-Generaal Rijkswaterstaat, Adviesdienst Verkeer en Vervoer AVV, Rotterdam.
. Energie Overheid (2014). Dossier: Openbare verlichting. Retrieved 29 January 2018 from www.energieoverheid.nl/dossiers/openbareverlichting.
. Platform Lichthinder (2018). Ecologie. Retrieved 29 January 2018 from www.platformlichthinder.nl/thema/ecologie.
. Schreuder, D.A. (1996). Openbare verlichting voor verkeer en veiligheid. Kluwer Techniek, Deventer.
. Winter, A. de & Adams, T. (2015). Richtlijn ontwerp autosnelwegen verlichting. Rijkswaterstaat WVL, Den Haag.
. CROW (2000). ROA handboek bermbeveiligingsvoorzieningen. CROW, Ede.
. CROW (2013). Handboek wegontwerp: Basiscriteria. CROW, Ede.
. CROW (2013). Handboek wegontwerp: Erftoegangswegen. CROW, Ede.
. CROW (2012). ASVV 2012. Aanbevelingen voor verkeersvoorzieningen binnen de bebouwde kom. CROW, Ede.
. CROW (2005). Handboek lichtmasten. CROW, Ede.
. AVV (2006). Handboek dynamische verlichting autosnelwegen. Rijkswaterstaat, Rotterdam.
. Martens, M.H. (2005). Kunnen we met minder openbare verlichting toe? Een veldstudie in Drenthe. TNO Defensie en Veiligheid, Soesterberg.
. Rijkswaterstaat (2018). Minder verlichting op snelwegen. Retrieved 4 January 2018 from www.rwsleefomgeving.nl/onderwerpen/ovl/nieuws/content/minder-verlichting.
. Schepers, P. (2011). Verkeersveiligheidseffecten van uitschakeling van verlichting en de relatie met verkeersintensiteit. Rijkswaterstaat Dienst Verkeer en Scheepvaart, Delft.
. Veluwen, A. van & Vries, Y. de (2015). Publieksrapportage rijkswegennet. Ministerie van Infrastructuur en Milieu, Directoraat-Generaal Rijkswaterstaat, Water, Verkeer en Leefomgeving WVL, 's-Gravenhage.
. Hogema, J.H. & Horst, A.R.A. van der (1998). Dynamische openbare verlichting (DYNO). Fase 4: synthese. Rapport TNO-TM 1998 C-065. TNO Technische Menskunde, Soesterberg.
. Rijksoverheid (2018). Wanneer moet ik mijn autoverlichting gebruiken? Rijksoverheid. Retrieved 8 January 2018 from https://www.rijksoverheid.nl/onderwerpen/verkeersveiligheid/vraag-en-antwoord/wanneer-moet-ik-mijn-autoverlichting-gebruiken.
. Rijksoverheid (2018). Regeling voertuigen. Rijksoverheid. Retrieved 9 January 2018 from http://wetten.overheid.nl/BWBR0025798/2018-01-01.
. Rijksoverheid (2018). Wat zijn de regels voor verlichting en reflectie op mijn brommer? Rijksoverheid. Retrieved 9 January 2018 from https://www.rijksoverheid.nl/onderwerpen/brommer/vraag-en-antwoord/wat-zijn-de-regels-voor-de-verlichting-en-reflectie-op-mijn-bromfiets-brommer.
. Rijksoverheid (2018). Wat zijn de regels voor fietsverlichting en reflectie op een fiets? Rijksoverheid. Retrieved 8 January 2018 from www.rijksoverheid.nl/onderwerpen/fiets/vraag-en-antwoord/wat-zijn-de-regels-voor-fietsverlichting-en-reflectie-op-een-fiets.
. Kuiken, M. & Stoop, J. (2012). Verbetering van fietsverlichting. Verkenning van beleidsmogelijkheden. Ministerie van Infrastructuur en Milieu. Rijkswaterstaat Dienst Verkeer en Scheepvaart, Delft.
. Goldenbeld, C., Schagen, I. van, Moore, K., Loenis, B., et al. (2017). Monitor Verkeersveiligheid 2017 – Achtergrondinformatie en onderzoeksverantwoording. R-2017-17A. SWOV, Den Haag.
. Koornstra, M., Bijleveld, F. & Hagenzieker, M.P. (1997). The safety effects of Daytime Running Lights. R-97-36. SWOV, Leidschendam.
. Elvik, R., Christensen, P. & Olsen, S.F. (2003). Daytime running lights; A systematic review of effects on road safety. Institute of Transport Economics TØI, Oslo.
. Eriksson, G. & Sandin, J. (2017). Daytime running lights. European Road Safety Decision Support System, developed by the H2020 project SafetyCube. Retrieved 17 April 2018 from www.roadsafety-dss.eu.
. Brouwer, R.F.T., Jansen, W.H., Theeuwes, J., Duistermaat, M., et al. (2004). Do other road users suffer from the presence of cars that have their daytime running lights on? TNO Human Factors.
. Craen, S. de, Doumen, M.J.A., Bos, N.M. & Norden, Y. van (2011). The roles of motorcyclists and car drivers in conspicuity-related motorcycle crashes. R-2011-25. SWOV, Leidschendam.
. Broeks, J., Boxum, J. & Zengerink, L. (2016). Lichtvoering fietsers 2015/2016. Goudappel Coffeng, Rijkswaterstaat Water Verkeer en Leefomgeving, Delft.
. Broeks, J., Boxum, J. & Zengerink, L. (2015). Onderzoek fietsverlichting uitgaansgebieden - Zomer 2015. Goudappel Coffeng, Rijkswaterstaat Water Verkeer en Leefomgeving, Delft.
. Rijkswaterstaat (2016). Openbare verlichting Rijkswaterstaat wordt led. Retrieved 29 January 2018 from www.rijkswaterstaat.nl/over-ons/nieuws/nieuwsarchief/p2016/10/openbare-verlichting-rijkswaterstaat-wordt-led.aspx. SWOV (2018). Public lighting and vehicle lighting. SWOV-fact sheet, July 2018, The Hague.